Island Divers dive centre in Cowes is fully stocked and equipped with dive gear to meet all of your diving needs whether it’s equipment, gas or rental equipment. What we don’t have in stock we can get for you usually within the next two-three working days! We do air fills and nitrox on site. PLEASE NOTE – In order to purchase enriched air nitrox fills, your cylinders must have been oxygen cleaned within the last 12 months. You must also present a training certification card appropriate for the required gas. 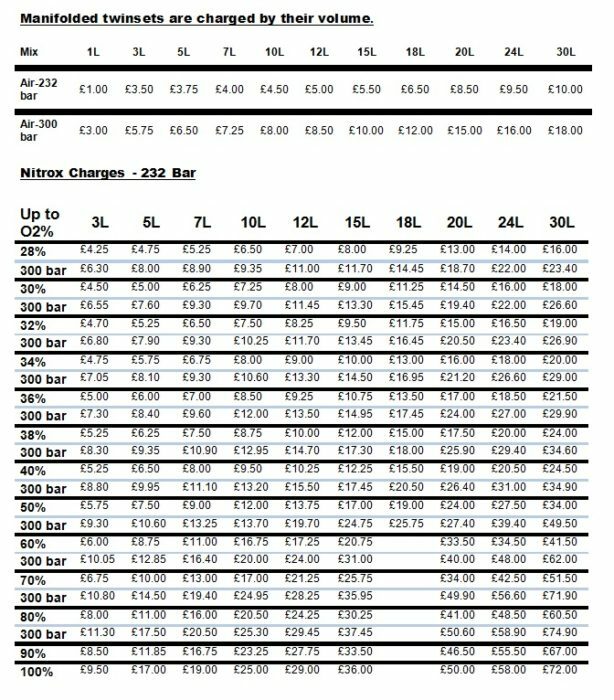 Below you will find our latest price list for 232-bar air and nitrox; twinsets are charged at double the single cylinder rate. Please note that these prices are subject to change. Island Divers Ltd | Powered by Mantra & WordPress.